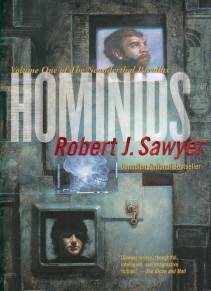 Robert J. Sawyer’s Hugo Award winning Hominids is the first book in The Neanderthal Parallax, a trilogy that brings together two vastly different cultures and peoples - humans and Neanderthals. In Hominids, Neanderthal physicist Ponter Bobbit is accidentally transferred from his world into our universe when a quantum-computing experiment goes awry. Ponter’s arrival does not go unnoticed as he nearly destroys the Sudbury Neutrino Observatory in the process. Fortunately for Ponter he is befriended by a number of scientists that treat him not simply as curiosity, but as an equal once they learn he is physicist and a scientist in his own world. Meanwhile back in his own universe Ponter’s scientific partner Adikor Huld tries to unravel the mystery behind his disappearance. Charged with murder, Adikor’s life and that of his offspring are on the line should he be convicted. Author Robert Sawyer succeeds in elevating Hominids above the standard stranger-in-a-strange-land tale by bringing to life not only a fully realized Neanderthal character in Ponter Boddit, but also a complete Neanderthal civilization. Sawyer puts travel to an alternate universe to good use, skilfully juxtaposing our culture against that of a vastly different Neanderthal culture. While many SF authors have shown us the shortcomings of our species through the eyes of alien cultures, Hominids is unique in that the aliens of the story are not from a distant world, but from our own. An underlying question of the book is how much of our behaviour is genetic and how much of it is driven by other factors such as culture. By having both Neanderthals and humans evolved on the same Earth, albeit from parallel universes, Sawyer has removed the natural environment as a factor in the equation. Among the differences, Ponter is amazed to learn that humans number in the billions on this planet in spite of birth control. Conversely, Neanderthal civilization has stabilized its population in the millions using natural birth control. Hominids paints a picture of Neanderthal civilization as a virtual utopia. In addition to living in harmony with the natural environment, Neanderthal society has risen above many of the social ills common to our own civilization with the aid of the companions and the alibi cube. A kind of built-in wristwatch and biometric monitor, the companion connects the wearer to a global information network and serves to record the subject's every action to their private alibi cube. While at first glance the companion seems to be Big Brother in action, Sawyer shows that such powerful technology can be of huge benefit to society and that it's power can be remain in the hands of the individual. The companions and alibi cubes are both brilliant technological and story-telling devices that serve many purposes throughout the novel. The cracks in the Neanderthal utopian society can be seen in the zeal with which genetic selection is applied to weed out undesirable social traits. The failure of one individual becomes the failure of the person's entire genetic line. Unlike many novels that are written as series or trilogies, Hominids does NOT leave you hanging at the end of the book. Rob Sawyer does a good job at wrapping up the main story that runs through the book while sufficiently enticing you with the premise and the characters to make you want to pick up the next book in the series, Humans. Hominids and Humans are currently available in both paperback and hardcover. The final book in the trilogy Hybrids has just been released in hardcover. For more information on these books or other books by Robert J. Sawyer, I highly recommend a visit to his website www.SFWriter.com.